Booming dog training business, A Pleasant Dog, moves to the Baxter Neighborhood this summer, June, 2016. A Pleasant Dog, doesn’t just train dogs, they train the humans who love them too. 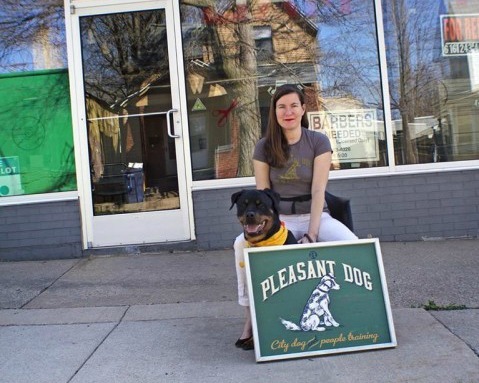 Jenn Gavin, owner of A Pleasant Dog (City dog & People training) had been training dogs for 20 years, when she realized there were no dog trainers in downtown Grand Rapids. As city-dog owners know, there are many challenges which are unique to urban dogs. Gavin saw a lack of cohesion between the experiences of urban dogs, and the teachings of their suburban trainers and decided it was time to open a training business of her own. Fast forward two years to now, A Pleasant Dog has seen major growth, going from a one woman operation, to a flourishing full service training business with four trainers, and two interns. Covering intro level courses and training, intermediate, AKC Good Canine Citizen certification, agility sports, training for reactive and/or aggressive dogs AND service dog training for children with Autism. After the first year, Gavin knew it was time to begin searching for a building, but where, and how could this happen? 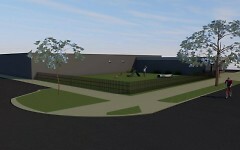 Gavin had been searching for a space in a densely populated urban environment in order to fulfill the business model of “city dog & people training.” The new space is located at Wealthy and Barth, just west of Wealthy Theatre. Formerly, the space was used as a Barber Shop called Jammin Cuts. Gavin has taken great care to knock on doors and have conversations with neighbors about her new venture in their neighborhood, and has been met with lots of support. She has also reached out to both the Baxter Neighborhood Association and East Hills Council of Neighbors, and received much hoped for support from them as well. East Hills Council of neighbors has indicated unanimous support from their entire board. It has been extremely important to Gavin to make sure that she is building strong community relationships with the neighbors, as she knows that folks who have been in the neighborhood longer than she, may have preferred the space to be used for a different kind of business. The old barber shop is located in a Traditional Business Area which means that A Pleasant Dog will need to obtain a special land use permit for the space to be used for dog training purposes, Gavin will go before the Grand Rapids Planning Commission on May 12, 2016. A Pleasant Dog donates time regularly to the community through school outreach programs, free dog safety training, helping rescue organizations and shelters, and providing affordable training options for lower income families. Gavin is hoping to open a small daycare for five to seven dogs at the new location, in addition to the training programs that will be offered in the space. Some of the dogs would stay at the facility and some would go to Shaggy Pines, a private dog park in Cascade. 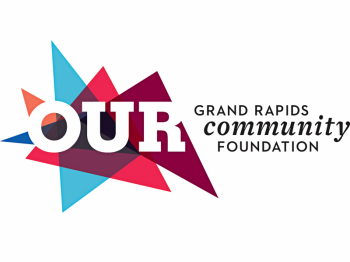 A Pleasant Dog is working in collaboration with local dog walking company Nature of the Dog and Shaggy Pines dog park, the collaboration will prove to bring some exciting things for many Grand Rapids dog owners. "Living in an urban environment can be tough on dogs and their people. We make it fun again by giving urban dogs, rescue dogs and their people the very best quality of life is what we do. We have the very best job ever," says Gavin. The new space has a tentative opening date of June 1, 2016. For more information about training services visit A Pleasant Dog's website.